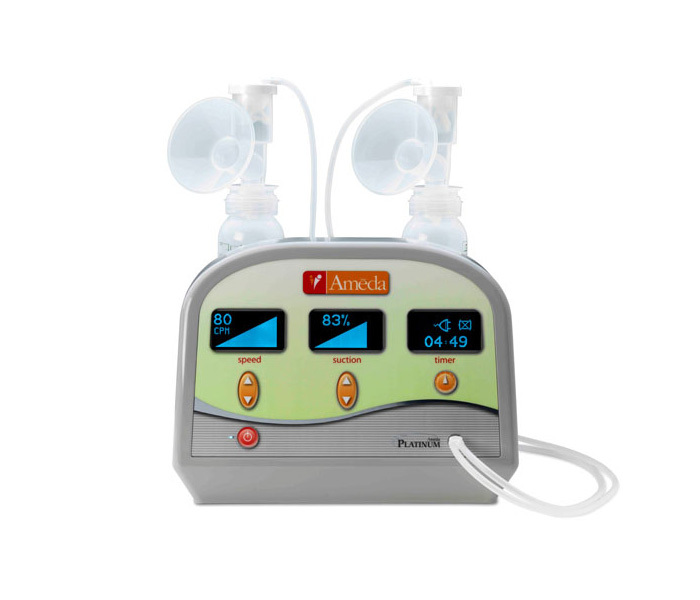 Now available for hire, the Ameda Platinum Breast Pump is the newest pump available for hire in Australia. Achieve customised comfort and control of up to 80 cycles per minute and suction strength up to 250 mg mercury (more than any other pump). Visual LCD display and digital touch allows personalised adjustments by 1% increments. 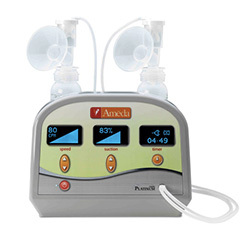 Adjust pump settings to your own body’s response and milk flow. Inbuilt timer to keep track of your pumping with automatic power off after 60 minutes. Simple to use HygieniKit Milk Collection System delivers Proven Airlock Protection™. It is the world’s only proven protective barrier to help protect breast milk and the baby from bacteria, mould and viruses while pumping. Convenient built-in bottle holders secured bottles upright on top of the pump and Ameda milk bags connect easily through an adaptor. Single or Double HygieniKit Milk Collection must be purchased with hire. Ameda milk storage solutions also available for purchase.